A classic of American cinema...'In Cold Blood' retains its relevance today, even as random shootings continue to appall. 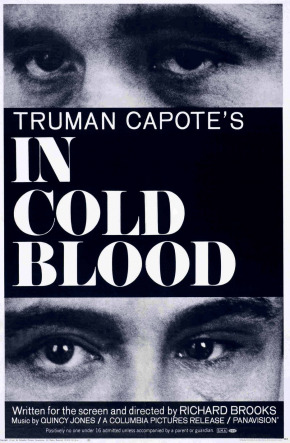 In Cold Blood, the film version of Truman Capote’s immensely popular true crime novel, was nominated for four top Oscars in 1967. Richard Brooks received two nominations, for Best Director and Best Adapted Screenplay, and the film was also nominated for Conrad Hall’s striking cinematography and Quincy Jones’ memorable score. In his best-selling book, Capote chronicled the events leading up to and following the senseless murders of a family of four in Holcomb, Kansas in 1959. He drew a pointed contrast between the prosperous, all-American Clutter family and the two social outsiders, Perry Smith and Richard Hickok, who committed the murders. In adapting the book, Brooks (the Oscar-winning writer-director of such films as The Blackboard Jungle, Cat on a Hot Tin Roof, Elmer Gantry, and Sweet Bird of Youth) resolved to be as faithful as possible to Capote’s chronicle, even filming in many of the actual locations where the events took place. With Capote’s encouragement, Brooks cast unknown actors as the two killers, and the performances of Robert Blake as Smith and Scott Wilson as Hickok earned critical raves. More established actors John Forsythe, Paul Stewart, and Will Geer filled out the supporting cast. Brooks also bucked the industry practice and decided to shoot the film in black-and-white at a time when color cinematography had become virtually mandatory for big-studio films. Scott Wilson made his film debut earlier in 1967, in the Oscar-winning In the Heat of the Night. In Cold Blood was only his second movie. He went on to co-star in John Frankenheimer’s The Gypsy Moths, the Robert Redford version of The Great Gatsby, Philip Kaufman’s The Right Stuff, The New Centurions, The Ninth Configuration, and more recent appearances in Dead Man Walking, The Last Samurai, Monster, and Junebug. He also is known for his roles in the popular TV series CSI and The Walking Dead.